Life magazine of May 15, 1970 showing one of the Kent State University students who was shot by National Guardsman during a time of unrest over the Vietnam War. Click for copy. “Ohio” is the name of a song that marks one of America’s darkest moments on the home front during the Vietnam War. The song came in reaction to the May 1970 shooting deaths of four students at Kent State University in Kent, Ohio — students shot by National Guard troops sent there to quell student unrest over the Vietnam War. “Ohio” — performed by the rock group Crosby, Stills, Nash & Young — is both a commemorative tune and a protest song that became popular, rising on the music charts following the shootings. More on the song in a moment. First, the events leading up to the shootings. On April 30th, 1970, U.S. President Richard Nixon addressed the nation in a televised broadcast in which he explained that American military troops, engaged in the Vietnam War, had been sent into neighboring Cambodia. This action — perceived by many as an expansion of the war and an invasion of another country — came in the midst of an already contentious national mood over the Vietnam War. Student protests over the war had already occurred on many college campuses. With the Cambodian invasion, more protesting ensued, including protests at Kent State University, located in the town of Kent in the northeastern Ohio, not far from the Pennsylvania border. In the town of Kent, on Friday evening, May 1st, following daytime demonstrations on campus, some store fronts were damaged, leading to a call to Ohio Governor James Rhodes and his activation of a National Guard unit. National Guardsmen with bayonets fixed near Taylor Hall at Kent State University, prior to shootings. On Saturday, May 2nd, some students helped clean up the damage that had occurred in town. However, later that evening, an Army Reserve Officer Training (ROTC) barracks on campus was surrounded by some 1,000 protesters, with a few setting it on fire. Tensions mounted on all sides along with misunderstandings. The National Guard, meanwhile, herded students into dormitories. On Sunday morning, May 3rd, Ohio’s Republican Governor James Rhodes, in a press conference that was also broadcast to the troops on campus, vowed to “eradicate the problem” of protest at Kent State. Later that day, some impromptu demonstrations occurred in the streets with tear gas being fired by the Guard. As the planned campus demonstration for Monday, May 4th proceeded, about two thousand students gathered on a commons area. The National Guard assumed a position nearby with loaded weapons and fixed bayonets. The students were ordered to disband and things soon got out of control, resulting in the Guard firing on the students. It was later determined that the Guard fired between 61 and 67 rounds over a period of 13 seconds. Four students were killed — two men and two women; two of whom were 19 years old and two 20. Nine other male students were also wounded, one left with permanent paralysis. Most of the injured were also in their early 20s. Among those shot, not all were demonstrators; some were simply innocent bystanders. The incident sparked national outrage (see “Sources” below for links to more detailed accounts). Mary Vecchio, screaming over the dead body of Jeffrey Miller, killed at Kent State on May 4, 1970. Photo was taken by undergraduate John Filo and appeared on newspaper front pages the next day. It has become the iconic image of that tragic day. The press and national media covered the story in detail, with many front-page newspaper accounts using what would become the iconic photograph of the event — a young girl with arms outstretched screaming over the body of one of the slain students. In the immediate aftermath of the shootings, protests and a student strike ensued across the country. Some newspapers carried Nixon’s comments as a separate story on May 1st, the day the Cambodia story had made front-page headlines. In the Milwaukee Journal of May 1, 1970, for example, the Cambodia incursion was the dominant front-page headline, but also just below the fold was a second headline, “Nixon Rips ‘Campus Bums’.” Other papers and newscasts also covered the president’s comment and it reverberated across the nation. As one account would later put it, the comment was like pouring gasoline on a fire. May 18, 1970: Newsweek made the Kent State shootings its cover story. Click for copy. Two days after the Kent State incident, police wounded four demonstrators at the University of Buffalo. On May 8th, some 100,000 protesters — angered over Kent State and the Cambodian invasion — gathered in Washington. Another 150,000 protested in San Francisco. Nationwide, four million students and 450 universities, colleges, and high schools would become involved in the student strike, which included mostly peaceful protests and walkouts. However, on some campuses, ROTC buildings were attacked or set on fire, and 26 schools witnessed clashes between students and police. National Guard units were mobilized on 21 campuses in 16 states. Public opinion polls, meanwhile, supported Nixon’s actions, with 50 percent of the American public backing him in polls taken during the second week of May. Fifty-eight percent blamed the students for what had occurred at Kent State. In one pro-Nixon demonstration in New York City on May 8th, some construction workers supporting the President’s actions rioted and attacked demonstrating students. Following the Kent State tragedy there were extensive investigations that went on for years, with long-running legal proceedings and numerous books and articles written, some offering conspiracy theories. The event was dissected from beginning to end to determine who was responsible, but debate continues to this day regarding what some believe are still unanswered questions (see “Sources” below for more detail & links). But one notable reaction to the Kent State shootings came with the song “Ohio” by the rock group Crosby, Stills, Nash & Young — a song that reached the airwaves quite soon after the event. Single sleeve for the Crosby, Stills, Nash & Young song, ‘Ohio.’ Click for digital version. David Crosby, Stephen Stills, and Graham Nash — each a singer, songwriter and guitarist — had formed their group, “Crosby, Stills & Nash” in 1968-69. Their debut album, Crosby, Stills & Nash, released in mid-1969, became quite popular among young listeners and especially on college campuses across the country. The group became known for their lyrics and melodic harmonies, and particularly songs from that first album, including: “Marrakesh Express,” “Suite For Judy Blue Eyes,” “Guinnevere,” “Wooden Ships,” and “Helplessly Hoping.” Another song on that album, “Long Time Gone,” by David Crosby, was a response to the 1968 assassination of Robert F. Kennedy. “Marrakesh” and “Judy Blue Eyes” also became successful singles. 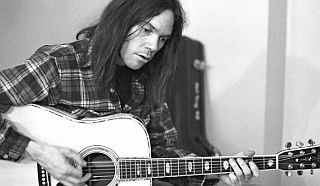 Neil Young, shown here at about age 25, wrote the song, "Ohio". By March 1970, now a foursome, Crosby Stills, Nash & Young (CSN&Y) released a second album, Déjà Vu. In addition to having advance orders for more than 2 million copies (it eventually sold more than 7 million copies), this album included additional songs that marked the group as speaking for their generation and the unsettling times. Among these was “Woodstock,” a song commemorating the giant gathering at the August 1969 music festival in New York’s Hudson Valley north of New York city (the song “Woodstock” was written by singer-songwriter Joni Mitchell who released her own somewhat different version). “Teach Your Children,” was another “message” song from the Déjà Vu album. Both became Top 20 hits as singles. Then came the Kent State shootings in early May 1970. Another Kent Stater on May 4th, 1970 was John Filo, a young undergraduate working in the Kent State photo lab. As the protest ensued that day, he decided to grab his camera and see if he could get an interesting picture. He saw one student waving a black flag on the hillside, with the National Guard in the background. He took that photograph, believing he had recorded the moment. As he wandered through a parking lot where a lot of the students had gathered, the National Guard suddenly opened fire. Filo thought they were shooting blanks, and started taking pictures. A second later, he saw Mary Vecchio crying over the body of one of the students who had just been killed. He took the picture. A few hours later, he started to transmit the photos he had taken to the Associated Press from a small newspaper in nearby Pennsylvania. The photograph won him a Pulitzer Prize. Neil Young by then had already demonstrated his singer-songwriter talents on previous work and he brought an important dimension to the group’s sound and message. His song “Ohio,” about the Kent State shootings, captured some of the anger and frustration felt by many young people at that time. According to the story behind this song, Young was given an early copy of the Life magazine issue that had run the dramatic cover photo of a shot student being attended on its May 15th, 1970 issue (photo at top of page, above). David Crosby had given him the magazine copy, and after Young looked at the photos and read the story, he reportedly disappeared for several hours, returning later with his song. The four musicians then rehearsed a version of the song which was later recorded on the evening of May 15th, 1970 at the Record Plant Studios in Los Angeles. The foursome, with other back-up musicians, recorded it live in just a few takes. During the same session they also recorded what would become the single’s B-side, Stephen Stills’ ode to the Vietnam War’s dead, “Find the Cost of Freedom”(below). The two songs were then mastered and the single rush-released by the Atlantic record label soon after the recording session. It was being sold on the market as a 45 rpm single in June and “Ohio” was being heard on the radio even before that, within weeks of the shootings. The new song, however, wasn’t welcomed everywhere. In some parts of the country it was banned from radio playlists — especially AM radio, the mainstream pop radio in those days. The song was held off the air at a number of those stations because of it’s “anti-war” and “anti-Nixon” sentiments. Meanwhile, FM radio, then regarded as underground radio, played the song without hesitation. In any case, the song’s lyrics — especially the refrain, “four dead in O-hi-o” — became a ringing anthem for a generation angered by the war and what had happened at Kent State. In any event, “Ohio” entered the music charts on July 11th, 1970 and reached No. 14 at its peak, remaining in the Top 40 for about seven weeks that summer. “Ohio” was also listed at No. 395 on Rolling Stone magazine’s “Greatest Songs of All Time” in December 2004. And in 2009, it was inducted into the Grammy Hall of Fame. Meanwhile, years later, Crosby, Stills, and Nash visited the Kent State campus on May 4, 1997, attending the 27th annual commemoration of the shootings. When asked about the song “Ohio” on this occasion and why the group was attending the commemoration, Graham Nash responded: “Four young men and women had their lives taken from them while lawfully protesting this outrageous government action. We are going back [to Kent State] to keep awareness alive in the minds of all students, not only in America, but worldwide…to be vigilant and ready to stand and be counted… and to make sure that the powers of the politicians do not take precedent over the right of lawful protest.” Crosby, Stills, and Nash performed “Ohio” at the end of the commemoration ceremony. Graham Nash, Stephen Stills, and David Crosby, on the cover of their 1969 album that helped advance the singer-songwriter genre of music in the 1970s. Click for CD, vinyl or MP3. Crosby, Stills, Nash and Young had a significant impact on the music scene of the late 1960s and 1970s. In 1969, their first album in particular, Crosby, Stills & Nash, proved very influential in advancing the singer-songwriter movement of that era, and helped define a kind of “California” or “soft rock” sound subsequently heard throughout the 1970s in groups such as The Eagles, Jackson Browne, Fleetwood Mac, and others. The album has been rated among the top 300 all time by Rolling Stone, and it has been issued on compact disc three times: the mid-1980s, again in 1994, and most recently as an expanded edition in 2006. Their second album as well, Déjà Vu, which was a No. 1 album at its release in March 1970, has also been named as one of the top albums of all time by Rolling Stone, VH-1, and others. David Browne's 2019 book on CSN&Y. DaCapo Press, 280pp. Click for copy. CSN&Y’s “Ohio” is perhaps the most well-known song associated with the Kent State shootings. However, at least a dozen other artists have also made Kent State tribute songs, including Dave Brubeck, the Beach Boys, Steve Miller, Bruce Springsteen, and Joe Walsh (see “artist tributes.”). See also at this website: “Kent State Reaction,” a short story on the protest and I-5 freeway occupation by students at the University of Washington in Seattle upon learning of the Kent State shootings; and also, “Crosby, Stills & Nash: 1960s & Beyond,” for a detailed piece on the music of CSN&Y. For an excellent historical perspective on the Kent State shootings and Cambodia, public reaction at the time, and the political aftermath, see the 2015 PBS documentary, Kent State: The Day the ’60s Died. National Guard in position on the campus of Kent State University, early May 1970. “Inquire, Learn, Reflect: May 4, 1970,” Kent State University Website with Links. Photos – “Four Dead Students and Nine Injured,” May 1970. I. F. Stone, The Killings at Kent State; How Murder Went Unpunished, New York: Vintage Books, 1970. I. F. Stone, “Fabricated Evidence in the Kent State Killings”, The New York Review of Books, Vol. 15, No.10, December 3, 1970. “At War with War” (cover story on student protest & Kent State shootings), Time, Monday, May 18, 1970. Tear gas being fired on demonstrators at Kent State University, May 4, 1970. “New Trial Called in Kent State Suit That Seeks Damages in ’70 Killings; Governor Told Not to Talk,” New York Times, Tuesday, September 13, 1977, p. 16. “Ohio Approves $675,000 to Settle Suits in 1970 Kent State Shootings; Governor Rhodes and 27 National Guardsmen Offer Their Regrets for Deaths of 4 and Injuries to 9; Earlier Trial Finding Deep Emotions Over Years,” New York Times, Friday, January 5, 1979, p. A-12. James Renner, “The Kent State Conspiracies: What Really Happened On May 4, 1970?”, Cleveland Free Times, Vol 14, No. 3, May 2006. William A. Gordon, Four Dead in Ohio, North Ridge Books, 1995. Photos from Kent State shootings, May 1970. The Report of the President’s Commission on Campus Unrest, Wash., DC: U.S. Govern- ment Printing Office, September 1970. The Parkersburg News of Parkersburg, West Virginia carried a somewhat different headline on the shootings, but also mentioned Cambodia in a top headline. 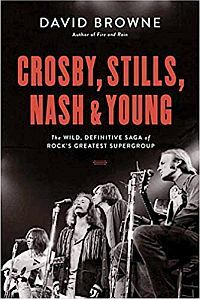 “Crosby, Stills, Nash and Young,” in Holly George-Warren and Patricia Romanowski (eds), The Rolling Stone Encyclopedia of Rock & Roll, Rolling Stone Press, New York, 3rd Edition, 2001, pp. 224-225. The Tony Bittick Interview: Text of Interview with Bill Halverson About the Recording of ‘Ohio’ and the Events at Kent State. Scott Bills, Kent State/May 4: Echoes Through a Decade, Kent, OH: Kent State University Press, 1988. National Geographic Channel documentary series, How It Was: Kent State Shootings, 2008. May 15, 1970 headlines from Athens, Ohio, home to Ohio University, where demonstrations also occurred. Headline below photo notes Jackson, Miss. shootings. Front page photo, courtesy Ken Steinhoff. Suzanne Goldenberg, Washington Bureau, “Tape Reveals Order’ to Shoot Vietnam Protesters; 37-Year-Old Recording of Kent State Killings Found,” The Guardian (U.K.), Wednesday, May 2, 2007. Christopher Maag, “Kent State Tape Is Said to Reveal Orders,” New York Times, May 2, 2007. Extensive On-Line Kent State University Photo Archive, at: University News Service, Photographs, April 30, 1970 – May 4, 1977 (bulk May 4, 1970). “At War With War,” (cover story on student protest & Kent State shootings), Time, Monday, May. 18, 1970. Ken Steinhoff, “Kent State: Never Forget,” Story & Photo Gallery. Ken Steinhoff, “Kent State: ‘Never Forget’,” PalmBeachBikeTours.com, May 4, 2009.